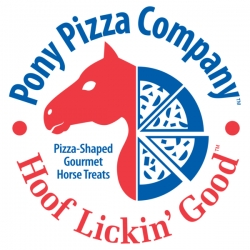 Pony Pizza Company™ was started in 2013 by a life-long horse lover and equestrian. There are a lot of horse treats on shelf, but there was nothing like our pizzas that are now available. Pony Pizza Company™ tried many different recipes and the recipe used now was developed in our home kitchen and taste tested by many horses till it was just right! We then took it to a commercial baker to start baking more pizzas in order to be able to take orders and start the journey to becoming a treat of choice for all horses and ponies forever and ever. We will continue to have our signature pizza toppings, Mint-O-Roni™ and Molasses Sausage™ and come up with new toppings that horses and ponies will enjoy.